Well-managed pastures are Always the Best Crop for the environment, for the grazing animal, and for you. A well- managed pasture is a dense, healthy crop of grass and legumes that can provide a security blanket for the land, good nutrition for the animal, and more money in your pocket. Achieving a well- managed pasture does not take a big investment. It does require animal and plant knowledge, identification of your goals, some equipment, and practice. Why is a Well-Managed Pasture Always the Best Crop? applied in the form of manure and fertilizer; and would provide a valuable product for human society. A well-managed pasture can do all this. 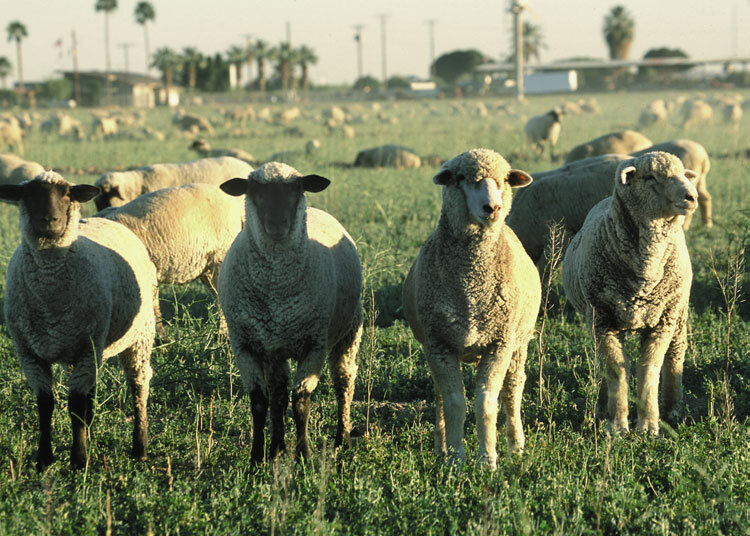 Managed grazing of pastures can provide nutritious grasses and legumes, or forage, rations for cattle, sheep, horses, goats, and other grazing animals. 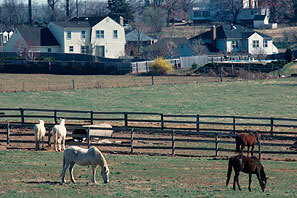 Pasture also gives the animals the freedom to exercise, choose their diet, and recycle their own manure (Figure 1). Pasture managed with controlled grazing can lower your costs by reducing equipment used, facility investments, and labor required. This results in the potential for decreased costs and increased net profit. Pasture managed with controlled grazing can lower your costs. Learn how plants grow and animals graze. Identify your goals for your pasture. Determine your fencing, water, and animal facility needs. Practice, practice, practice the art of grazing. Step #1. Learn how plants grow and animals graze. It rains, grasses and legumes grow, and the cow eats this forage; what’s to know? Animals can graze and forages will grow. But to achieve your goals, you need to know how plants grow and how animals graze. To achieve your goals, you need to know how plants grow and how animals graze. 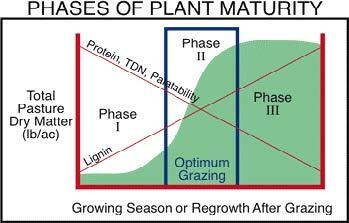 The three principles of plant growth are the growth cycle (Figure 2), what controls growth per year, and the importance of grazing management. Figure 2. The three phrases of growth. The growth cycle. Phase I is the first growth after dormancy or winter. It is supplied from the root reserves and is slow. There is limited plant growth but it is very high quality. In Phase II, the green leaves are big enough to use energy from the sun. This process causes a fast growth rate and a rebuilding of reserves. A high quantity and high quality of forage results. In Phase III, the growth rate slows as the plant produces seeds and plant decay begins. This yields a large quantity of feed but with decreasing quality. The ideal grazing system would start grazing near the end of Phase II growth and stop grazing with enough green leaf for rapid regrowth. These plant growth principles are usable for most all environ- ments and all kinds of plants. longest daylight if other factors are adequate. In areas with warm season forages and less rainfall, growth will depend more on rainfall. To increase the total amount of forage produced, you need to identify the limiting growth factor such as length of day or rainfall. Pastures grazed very short in the fall will be slower to grow in the spring. Your pastures are the product of how they have been grazed in the past. Your current grazing management will determine what your pasture looks like in the future. Spend time in your pastures learning what forages you have, how they grow, and how you and the environment affect their growth. These grazing principals work on irrigated or non- irrigated land and for sheep (Figure 4) or cattle grazing. How animals graze. Grazing animals go for the best plants first and get the most nutrition when first turned into a pasture. Therefore, we can control the level of animal performance by how much of the plant we make the animals eat. For high-input animals like dairy cows, pastures also need to be dense so the cow gets lots of forage with every bite. as six months. If animals are allowed to graze regrowth that is not given enough rest to restore root reserves, the plant is weakened. This lack of rest is overgrazing. The golden rule is that you move animals to a fresh area before they graze any plant regrowth. Step #2. Identify your goals for your pasture. There is not a “right” way to graze or manage your pasture because it depends on your goals. You might want to graze one way for maximum gain per acre or another way for maximum average daily gain per animal. You are in control, and your grazing system can change pasture plant species, plant density, regrowth rates, level of animal performance, and the diversity of the plant community. Managed grazing puts you in control. To create a successful grazing program, you need to write down short-term goals for your pastures and long-term goals for your grazing program. 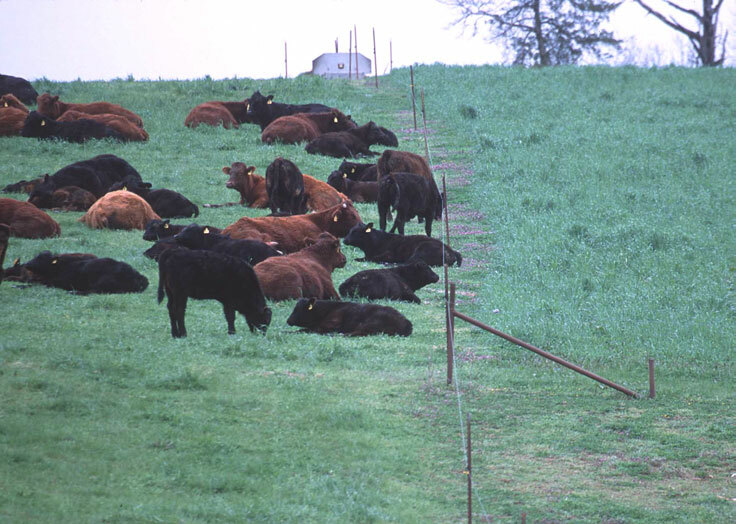 Test your grazing system practices against your long-term goals. The most important thing is that you set goals before you make plans and major investments. Where do you want to go? What profit or environmental or personal changes do you expect? To create a successful grazing program, write down your short- and long-term goals. Step #3. 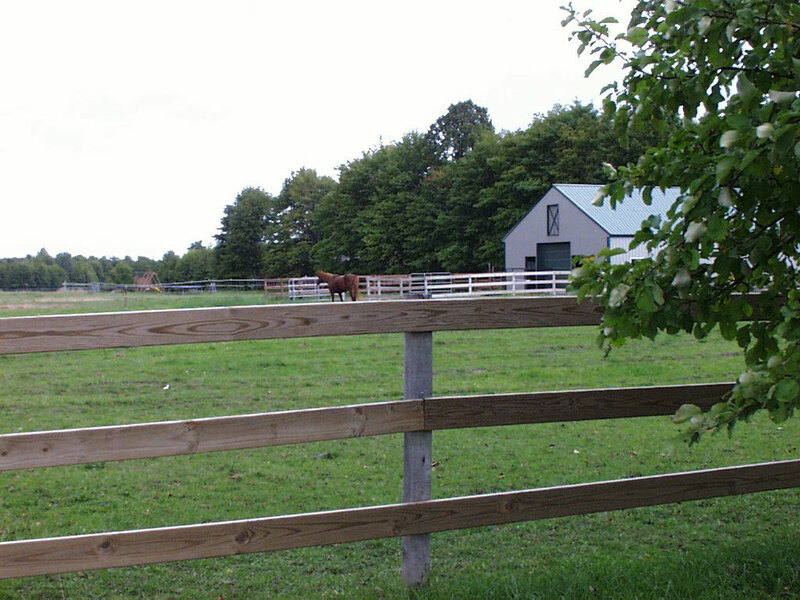 Determine your fencing, water, and animal facility needs. Fencing. New fencing materials and fencing techniques have greatly increased the fencing options. The first fencing decision is to decide where to use an electric (psychological) or a non-electric (physical) barrier fence. 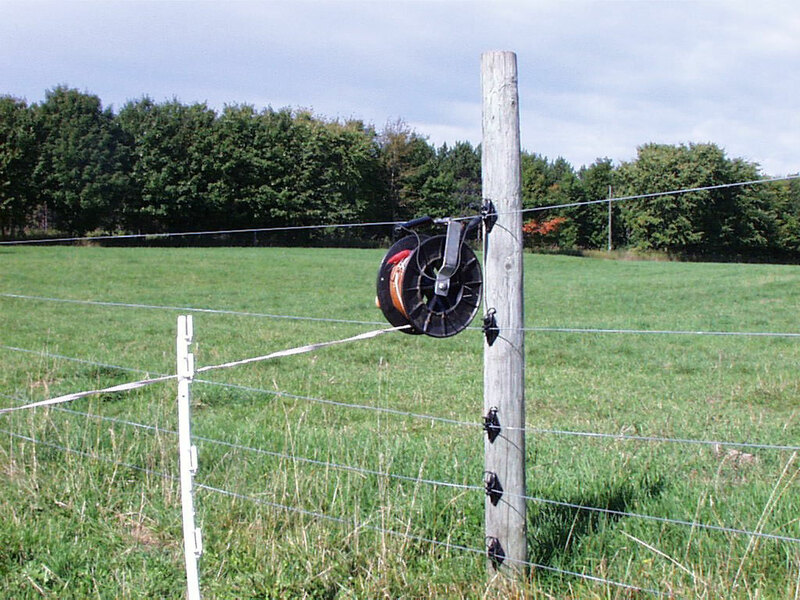 Electric fence is generally lower cost and is the most common choice (Figure 5). Non-electric fences should be used where escape would be very undesirable, animals could be crowded against the fence, or there is danger to humans, especially children (Figure 6). Figure 5. Electric psychological barrier fence. The fence must be effective. If the animals escape, you do not have controlled grazing. Design your fence for 99% of your animals and sell the 1% who are chronic escapers. Two more important items: the fence must be fixable and low cost over its usable life. Cheap materials may result in a high- cost fence in the long run since the cost of a fence is ½ materials and ½ labor. Design your fence for 99% of your animals and sell the 1% who are chronic escapers. Figure 6. Board physical barrier fence. Design your fence; number of posts, wires, gates, etc. 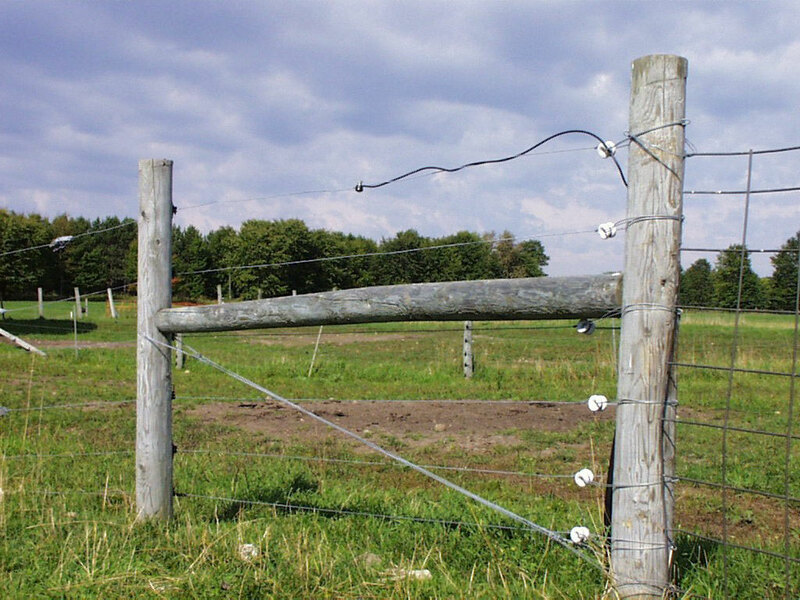 A good fence includes well- built corner and end posts. See Figure 7 for an example of good end post construction. Figure 7. Well-built post assembly. Animal facilities. 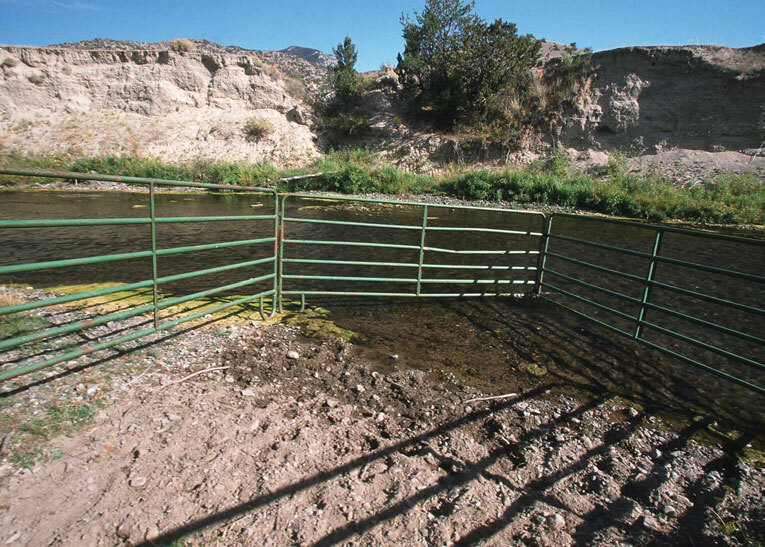 Managed grazing is a low-cost system, but investing in adequate facilities like good fencing is critical. Other animal facilities include handling equipment for gathering and working animals; lanes for mud-free, wet weather travel; and shade for extremely hot weather. Every pasture, every kind of animal, and every part of the country will have different challenges to a productive grazing system. Your responsibility as the manager is to identify the problems and apply solutions. Managed grazing is a low-cost system, but investing in adequate facilities like good fencing is critical. How do you design a fence, build a stream access site, or determine the correct fence charger? Local experts are often the best source of this informa- tion. Get to know your fence builders, extension agent, NRCS staff, and other land and animal experts in your area. Some of these organizations also have cost share programs for grazing and environmental conservation practices. The Internet and various websites are other important sources of information. Step #4. Practice, practice, practice the art of grazing. and the productivity of a pasture. If you do the right thing at the right time, grazing animals are good for grazing land. Knowledge of plant growth and how animals graze will help you do the right thing. Do not worry about having the correct size or number of pastures or be overwhelmed by the details of a grazing system. The most important thing is to get started on an improved grazing system. Your experience on your farm, combined with new grazing knowledge, is the best teacher. A well-managed pasture can improve the environment and your bottom line. If you do the right thing at the right time, grazing animals are good for grazing land. Have a Why are you grazing? What will success look like? Understand both the why and the how If you do not know why you are doing something, do not do it. More fences are just more fences, not a grazing system. Practice, monitor, re-plan, practice, monitor, re-plan . . .You may never get it all right, but with increasing knowledge and practice, you can get a little closer. Ben Bartlett, Dairy and Livestock Agent, Michigan State University, can be reached at 906-439-5880 or bartlett@msu.edu. The author wishes to thank Dan Undersander, University of Wisconsin; Terry Gompert, University of Nebraska Extension; Woody Lane, Lane Livestock Services; and Kevin Ogles, NRCS Grazing Specialist, for their review of this fact sheet. Contact The Stockman Grass Farmer, 800-748-9808, to purchase Intensive Grazing Management: Forage, Animals, Men, Profits. Contact the Iowa State University Extension Distribution Center, 515-294-5247 or www.extension.iastate.edu, to purchase Pasture Management Guide for Livestock Producers, 1998. Contact the University of Wisconsin Extension, 877-947-7827 or cecommerce.uwex.edu, to purchase Wisconsin Pastures for Profit, 2002. Contact University of Missouri Extension Publications, 800-292-0969 or muextension.missouri.edu, to purchase the 1996 Missouri Grazing Manual. 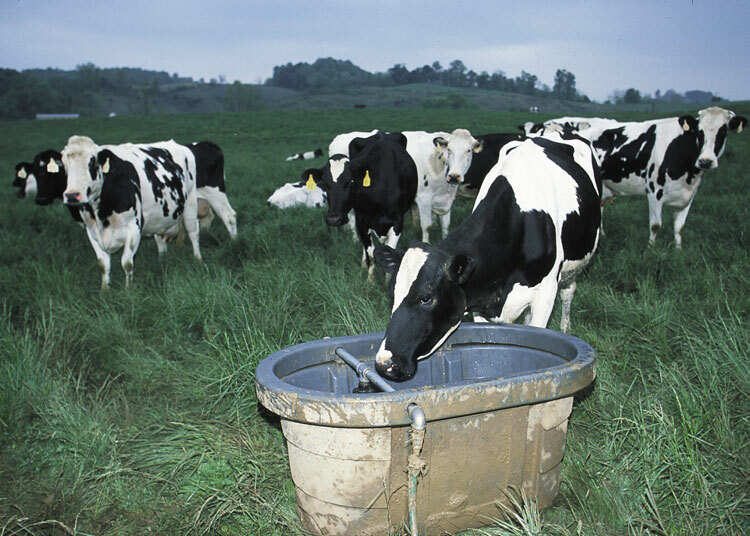 Contact Ben Bartlett, MSU Extension, 906-439-5880, to purchase Watering Systems for Grazing Livestock, 1998. Contact University of Wisconsin Extension, 877-947-7827 or cecommerce.uwex.edu, to purchase the CD Pastures for Horses, A Guide to Rotational Grazing, 2003.